Note: This is for new drivers who have driven with another ride-hailing platform. If you are not currently driving on a ride-hailing platform, please click here to learn about our special incentive for you. Have you always thought of driving with Grab? Do you want to earn more? Become a Grab driver partner this March and earn more than ever before – up to $1,070 a week for your first 4 weeks in incentives! 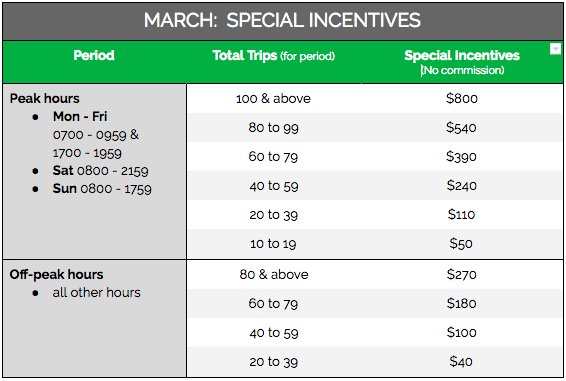 Up to $1,070/week in incentives for the first 4 weeks with Grab. You could earn a total potential of $4,280 in incentives…AND this is on top of your own earnings. Snapshot of our special incentives! All drivers who have driven at least 4 weeks, on another ride-hailing platform, prior to signing up with Grab. Please submit printed driver statements for verification. First-Trip Cash Bonus: Paid in CASH if you complete 1 trip within 2 weeks of activation. Payment made by Week 4.